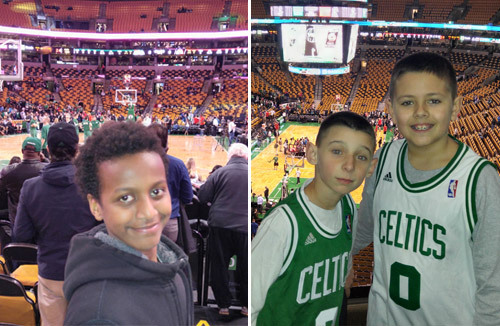 Charlestown, MA (March 21, 2016) – A group of young residents of Mishawum Park – a residential community of 337 apartment homes located on Main Street – recently took a special trip to TD Garden to see a Boston Celtics game and participate in the Video Producers of the Future event as a part of WeCast Productions The Forever Ink Project. More than 500 video professionals and youth, ages 5 to 18, from across the state attended the Video Producers of the Future event, created by Brandy Sales, WeCast Productions founder, in partnership with the Boston Celtics, which featured a panel discussion with television, video and film experts and a question and answer session. Attendees ended the night by watching the Celtics take on the Portland Trailblazers. For the third year, Mishawum Park has teamed up with WeCast Productions – an internet video production company – for The Forever Ink Project, an eight-week program made possible by a MassHousing Youth Resident Activities Program grant. Program participants learn the aspects of video production and valuable social skills, including stop motion, scriptwriting, storytelling as well as the importance of teamwork and decision making. Pictured (left): Mishawum Park resident Mathewos Solomon, 12, at TD Garden; (right): Mishawum Park residents Aidan Hanscom, 8, and Connor Boyle, 11, at TD Garden.